ProQuip tank agitators with ProQuip Doubly-pitched HiFlow impellers are used in many applications with mid-process viscosity changes. I hope you enjoyed our last blog on the history of glue and the use of ProQuip Doubly-Pitched HiFlow™ impellers in many modern glue and adhesive manufacturing processes. Modern glue and adhesive applications are examples of mixing applications with mid-process viscosity changes. In this blog, we look closer at these applications and how ProQuip tank agitators with Doubly-Pitched HiFlow impellers are ideally suited for them. The large diameter ProQuip Doubly-Pitched HiFlow™ impeller, in a typical three impeller configuration without baffles, almost fills the mixing tank to maintain top-to-bottom circulation. 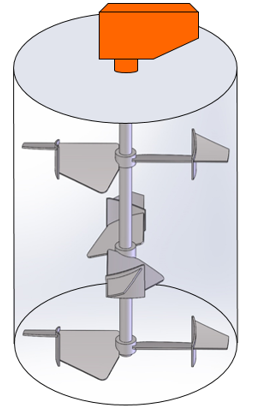 The Doubly-Pitched HiFlow impeller pumps in both directions and induces a vigorous top-to-bottom turnover of a vessel in a typical three impeller configuration without baffles (right). Water-like material circulates without excessive swirling. As viscosity increases, in applications like glue/adhesive manufacturing, top-to-bottom circulation is still maintained because the large diameter Doubly-Pitched HiFlow impeller creates a mixing zone essentially across the mixing tank diameter. This means viscous material cannot bypass the mixing zone because the entire diameter of the vessel is swept by the impeller. The Doubly-Pitched HiFlow impeller provides excellent agitation in the transition zone (Reynolds numbers in the range of 10-10,000) without requiring tank baffles. The proprietary design of the Doubly-Pitched HiFlow impeller results in a very low power demand. This makes it possible to use relatively large impellers without requiring excessive horsepower. Using the Doubly-Pitched HiFlow impeller, surface movement and overall circulation in the vessel is much greater than could be obtained by another design at the same power level. This allows dry product to be added to the batch at a faster rate. The very large diameter of the Doubly-Pitched HiFlow impeller means that the surface available for pulling down solids is much greater. For example, the addition of dry starch for adhesive manufacturing. The smooth geometry of Doubly-Pitched HiFlow impellers produces the same low level of shear as our patented HiFlow™ impeller. Combining this low shear and the low power demand for the Doubly-Pitched HiFlow impeller results in an ideal impeller for processes incorporating delicate or shear-sensitive components such as storage floor packaging of personal care products. For additional information, visit the Doubly-Pitched HiFlow impeller page. For help with industrial tank agitators or your mixing application, email applications@proquipinc.com or call us at 330-468-1850.